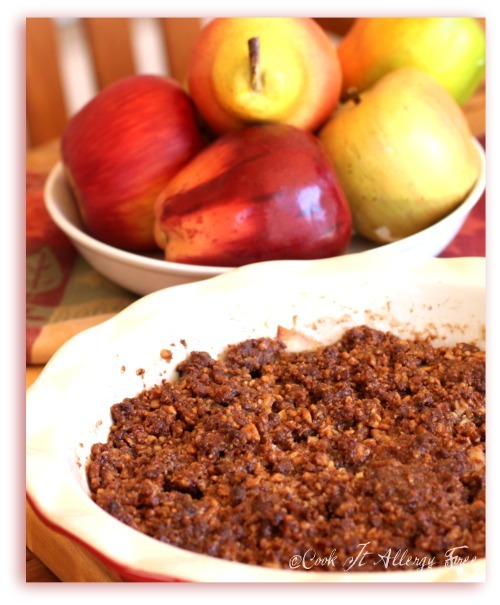 PART 6 of my Ultimate Thanksgiving Prep Series– Toffee Pecan Apple Streusel. I will not lie to you. This dessert is amazing. I almost prefer it to my Crustless Pumpkin Streusel Pie. Almost. As written, the recipe is naturally Gluten-free and Egg-free. However, with a couple of quick adaptions you can also make it Dairy-free and Nut-free for an amazing Allergen-Friendly Thanksgiving Dessert. So, no more teasing. Here you go. 1 1/4 cup Toffee bits, such as Heath Toffee Bits (not the milk chocolate covered ones), which are gluten-free but NOT Dairy-free or Nut-free. **FOR DAIRY-FREE AND NUT-FREE alternative, see note at end of directions. 1. Preheat oven to 350 degrees. In large bowl, mix together apples, sugar, vanilla, cinnamon, and lemon juice. 2. In food processor, pulse together toffee pieces, pecans (or Nut-Free replacement), gluten-free flour blend, and butter. Use on-off pulsing until the ingredients are all moist and beginning to clump together. 3. Place Apple mixture into a well-greased tart or pie plate. Press Toffee mixture evenly over apple mixture. Bake for 55 minutes to 1 hour, or until topping is beginning to crisp and bubble slightly. Watch to make sure it is not browning too much. 4. Serve with your choice of vanilla or cinnamon ice cream (Dairy or Dairy-Free) or drizzle with your favorite caramel sauce (Dairy or Dairy-Free). **FOR DAIRY-FREE, NUT-FREE toffee bit alternative: Line a baking sheet with parchment or wax paper. In HEAVY BOTTOMED saucepan (saucepan is key), over medium-high heat, combine 1 3/4 cups Fleischmann’s Unsalted Margarine, 2 cups white sugar, 1/8 tsp salt, 1/4 tsp vanilla. Bring mixture to a very low boil, stirring constantly. Do not let mixture get over 290 degrees. Cook for 8-9 minutes until amber colored and smooth. Pour onto lined baking sheet and refrigerate. Once hard, break into pieces. Will make more than you need for this recipe. PART 2: Cranberry Citrus Cider Sauce AND Green Bean and Shallot Salad with Champagne Vinaigrette. PART 3: The Gluten-Free Cornbread Recipe for the stuffing (with the Variation to make the Savory Cornbread Rosemary Muffins to go with the meal) and Crock Pot Mashed Potatoes. PART 4: The Gluten-free Cornbread and Crusty Bread Stuffing with Apples, Sausage, Pine Nuts, Golden Raisins, and…Pumpkin Puree. PART 6: Toffee Pecan Caramel Apple Streusel (Gluten-free and Egg-free already, with how-to’s to make this Dairy-free and Nut-free as well) and Crustless Pumpkin Streusel Pie. Yay! Here it is and it sounds and looks just as good as I thought it would! Man your guests are lucky. I love the dairy-free option – who knew it was that easy to make your own toffee bits at home! The possibilities are endless! Thanks Kim. And yes. There are so many possibilities for toffee bits. I am thinking of using some in one of my cookie recipes. Making your own makes way more than you need for this recipe so there are a lot leftover to find uses for. This is my first Thanksgiving eating gluten free. I am excited to find your stuffing recipe! I couldn’t bear to eat the traditional meal without the stuffing! Thanks a bunch! Hi Jane! Here’s is to your first gluten-free Thanksgiving! I know it will be amazing!! And you will NEVER miss it with this stuffing recipe. Half of our extended family still eats gluten and they all swear by this stuffing recipe, so I hope you enjoy it too!!! By the way that cherry crisp on your site looks amazing (left a comment, but may be in spam – always end up there). 😉 Hope you have a wonderful gf Thanksgiving, Jane. You are a crackerjack! 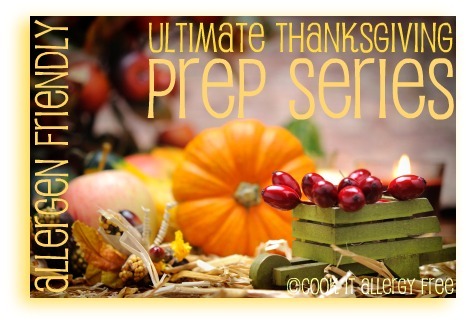 What a fabulous series – a boon for busy people who need access to T-giving allergy-friendly recipes. Great job Kim!!!! Hi Intolerant Chef! Thanks so much! Just read the story about the finger incident! Yikes! Glad he is on the mend! i will try this recipe, it looks great and yummy and i also love apple. Another pecan recipe. I love pecans! Hi Mel, Thanks so much for stopping by! OK. I’m going to do what I did with Shirley’s. Condensed version of what I remember. 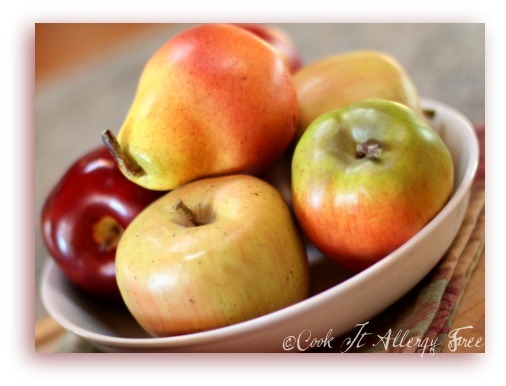 And, love the angle picture of apples and pear. So good, they look fake. But in a good way. Have been copying the angle pose, so you will probably see it on my blog soon. Hope it’s ok. This sounds like the most delicious dish. Apples, toffee, nuts, gluten free. Yummy. I’ve just been diagnosed with Celiac Disease does anyone know of any gluten free foods that taste good?